When you outlaw cargo bikes, only outlaws ride them! 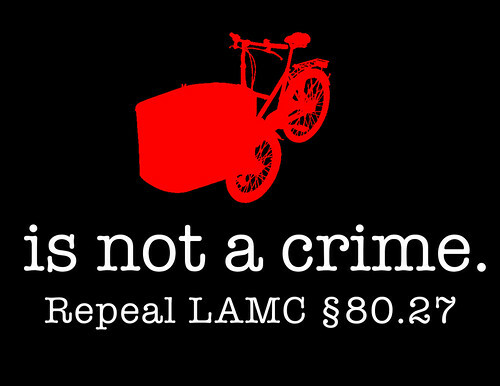 With Los Angeles’ long awaited bike plan entering its final stage of approval, I think it is a good time to discuss the repeal Los Angeles Municipal Code Section 80.27. I think we should strike the law from the books, or to replace it with the California Vehicle Code Section 21204 (which supersedes it, I believe). "A person operating a bicycle shall not ride other than upon the permanent and regular seat attached thereto, nor carry any other person upon such bicycle other than upon a firmly attached seat to the rear of the operator, nor shall any person ride upon a bicycle other than as above authorized. (Amended by Ord. No. 122,716, Eff. 10/5/62.)" This sounds reasonable (especially when it was written in 1962, prior to the modern California Vehicle Code) in that, at the time, there were no bicycles commercially available that safely carried cargo or passengers in front of the pilot. 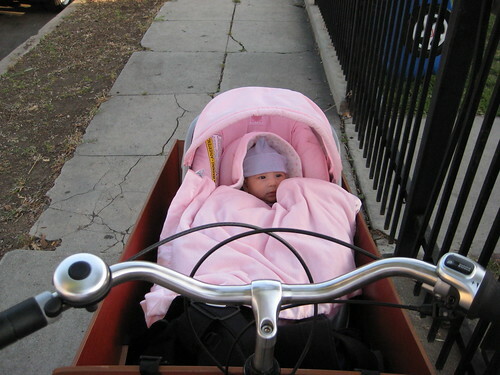 Today, however, there are lots of commercially available cargo bikes (many of which we carry at the Flying Pigoen LA shop) with front-mounted passenger space. These include my own Workcycles Bakfiets cargo bike, Babboe cargo bicycles and tricycles, CETMA’s bakfiets, and the famous Christiania cargo tricycle. 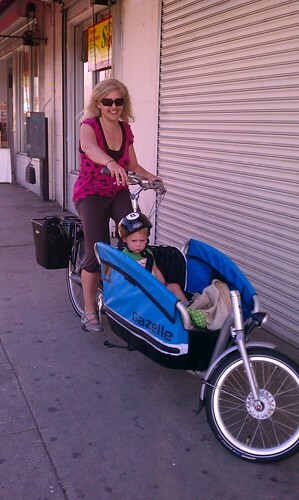 These are as safe as a rear-mounted baby seat or trailer (probably more safe! ), so a prohibition on these bikes seems, to me, unreasonable. (a)(1) A person operating a bicycle upon a highway shall not ride other than upon or astride a permanent and regular seat attached thereto, unless the bicycle was designed by the manufacturer to be ridden without a seat. 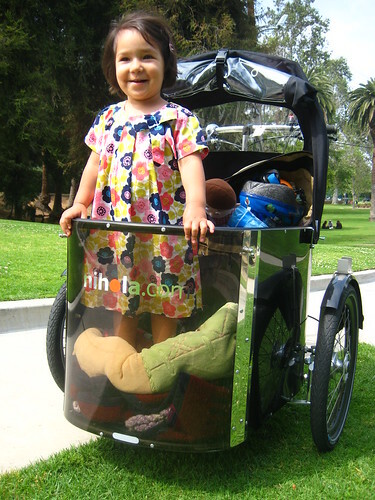 Front loading cargo bikes are a massive improvement over the standard “drag ’em from the back” child trailer strategy that most bike-riding parents employ for several reasons. First, it is a lot of fun to ride around with your kid(s) in front, looking at things, singing songs, and generally taking in the day together. When the kids are behind you and several feet back, the magic of the bike ride is of a different nature. More importantly, these front-loading cargo bikes represent a safe, fancy-looking, high status appearance to those that operate them – making bicycling a mainstream activity. For several generations, there has been no practical method of moving multiple children safely through the city other than by private motor car (or a very frustrating bus or train ride). These bicycles offer parents an escape from being merely chauffeurs to being active and visible participants in their childrens’ lives as well as showing that normal, employed, reasonable people can still have fun and ride bikes to get stuff done. Now, if that isn’t reason enough to repeal LAMC 80.27, I don’t know what is!